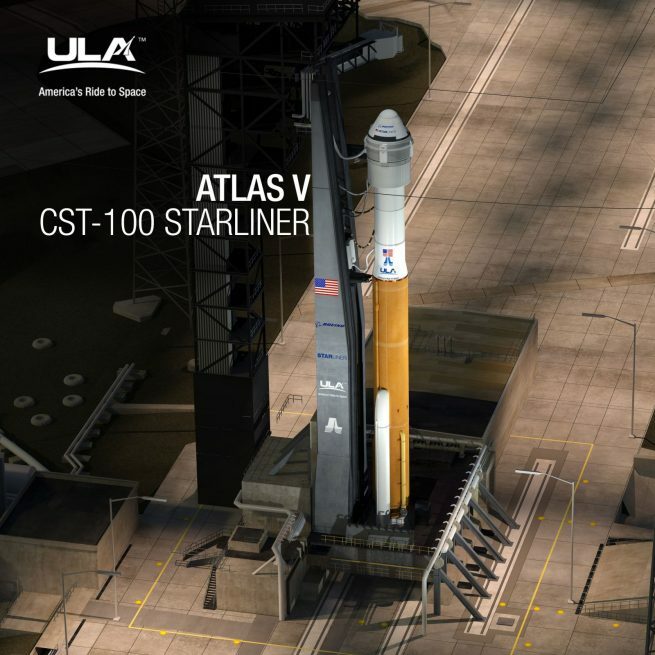 CAPE CANAVERAL, Fla. — United Launch Alliance (ULA) and Boeing unveiled an add-on aeroskirt to the Atlas V rocket that will launch Boeing’s CST-100 Starliner capsule for NASA. It was developed after engineers encountered difficulties with aerodynamic stability and loads resulting from the difference in width between the capsule and the rocket. The Starliner capsule is wider than the Atlas V launch vehicle on which it would sit atop. During the ascent phase, this would cause an aerodynamic dead zone just behind the spacecraft, generating drag and dangerous differences in pressure. The aeroskirt would attach aft of the spacecraft, extending the Starliner Service Module’s cylindrical surface to smooth out the air flow over the integrated capsule/rocket and bring load margins back to acceptable flight levels. Wentz said this configuration is unique because it combines the Atlas V launch vehicle without a payload fairing with the Starliner capsule, resulting in different aerodynamic interactions. According to ULA, the aeroskirt is a metallic orthogrid structure designed to be jettisoned once the atmospheric pressure during ascent gets low enough for aerodynamic forces to no longer be an issue. Following completion of the Production Readiness Review, fabrication of the aeroskirt is scheduled to begin this month at ULA’s factory in Decatur, Alabama. The Preliminary design review for the aeroskirt was completed earlier this month (October). This news comes after Spaceflight Insider’s previous report that the company has delayed its first operational flight of its CST-100 Starliner by an additional six months. As such, the current plan is for an unpiloted Starliner to launch atop an Atlas V in June 2018 with a piloted test in August. Boeing expects operational missions to begin a few months later. John Mulholland, Boeing’s vice president and program manager for commercial programs in space exploration, told Aviation Week the delays have resulted from several different challenges, all of which have been resolved or in the process of being resolved.